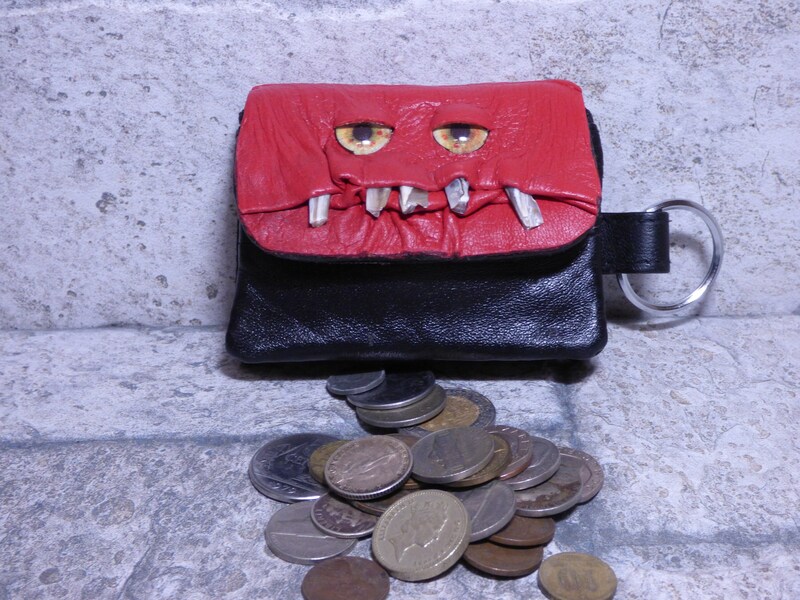 This coin purse is made of premium leather wrinkled and crinkled in just the right places, Each one is a One of a Kind with hand made eyes and teeth. He is zippered to keep the change he guards safe within, has a large open pocket with a separate zippered pocket and an attached key ring on the outside!! Perfect for that extra house key or car key!! This coin purse is 4 inches (101.6 mm) across the front x 3 inches ( 76.2 mm) tall x 1/4 inch (6.35 mm) deep (when completely opened). All my original pieces are signed by...me, Pippenwyck!!! I hope you like this coin purse!! There are many interesting things here so come visit often. You never know what you might find... Or what might find YOU!!!! This creature is called a Changeling. Their nest was hidden in the tall grass behind the cottage unbeknownst to me. Suddenly they were hatching one after the other!! They startled me, I tripped and some coins fell out of my pocket. All the Changelings pounced gobbling up the coins before I could stop them!! Quick as a wink I enchanted them into coin purses before they could escape!! Now they will guard the coins you put inside of them and should anyone try to purloin the coins they guard, Well, they may find themselves being gobbled up as well!!! The Changelings need a new home for I have found many more nests!!! Have you some extra coins to feed one?? ?